May 27th, 1994 photo of raging inferno in the chemical tank storage area of Shell’s Belpre, Ohio chemical plant, set off as a second fire by missile fragments from initial explosion in another part of the complex. (firefighter photo). adjacent units of the plant, as well as another area with large chemical storage tanks. One fragment from the initial explosion punctured a styrene storage tank some 600 feet away. This tank’s explosion and fire resulted in the burning of five additional styrene storage tanks containing approximately 3.5 million gallons of flammable products. The Parkersburg News of Parkersburg, West Virginia reporting on the May 1994 Shell explosion & fires: 'Disaster At Shell'. Throughout Ohio, and especially in the local region, the Shell explosion was front-page news. 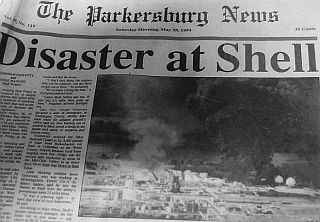 The Parkersburg News of Parkersburg, West Virginia, a town just across the Ohio River from Belpre, reported the incident with the May 28th headline: “Disaster at Shell” (photo at right). That story also included a front-page aerial photo of the Shell plant complex burning in two locations (see larger photo later below). 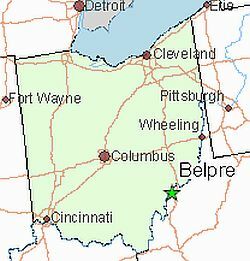 Belpre, Ohio is a small town in southeast Ohio on the Ohio River opposite Parkersburg, West Virginia. A town of about 6,800 people at the time of the Shell accident, Belpre is located about 110 miles southeast of Columbus, Ohio and about 150 miles southwest of Pittsburgh, Pennsylvania. The Ohio River, in fact, stretching from Pittsburgh, and flowing south and west along the Ohio-West Virginia border to the Mississippi River, became an industrial highway of sorts, making the area something of a chemical valley, with DuPont, GE, and others all locating plants in the Belpre-Parkersburg area in the 1950s and 1960s, using river barges to supply their operations and move their finished products. Map showing location of Belpre, Ohio on the Ohio River border with West Virginia. In 1961, the Shell Oil Company opened a plastics plant at Belpre along U.S. highway 50, building a complex of buildings there on about 15 acres. The plant was expanded at least twice after that – once in 1980 and again in 1990. The plant became known for making plastics, and in particular, Shell’s Kraton, a thermoplastic rubber used in automotive parts, wire, footwear, adhesives, and cable coverings. For the most part, things were good at the Belpre plant during those years. In fact, Shell had been crowing during the summer of 1993 about how this plant was meeting “stringent international quality standards” under something known as ISO 9002. But early morning on Friday, May 27th, 1994, just ahead of the Memorial Day weekend, things at the Shell plant were not quite right. It was about 6:20 a.m., and at that hour only 50 to 75 workers were on hand at the plant. Normally, the plant would fill to several hundred workers. An explosion occurred in the K-1 building at the plant about 6:25am followed by a fire, but soon spread to a chemical storage tank area. Then, at about 6:30 am, there was a violent explosion as the fire reached one of the tanks. Soon, five more chemical tanks there, holding millions of gallons of styrene and 400,000 gallons of diesel fuel, were burning, and they continued burning. 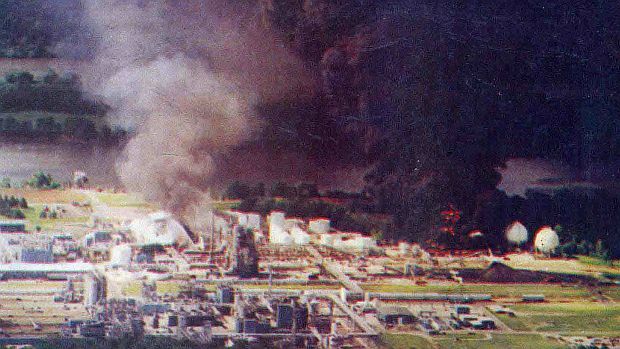 Front page photo from the May 28th 1994 “Parkersburg News” showing the Shell Chemical plant at Belpre, Ohio along the Ohio River, with two areas of the plant burning on May 27th, 1994, following an early morning explosion that day. Three workers were killed; 1,700 residents evacuated. ( Source: Mackey’s Antiques & Clock Repair, Parkersburg, WV). The fire raged for nine hours before being brought under control, as dozens of fire companies and some 150 firefighters from surrounding communities responded. At times, flames shot 300 to 600 feet into the air; and firefighters had to back away from their battle at various points due to the intense heat. One exchange among firefighters caught by local reporters for the Parkersburg News, had a fire chief in radio communication with his men who were reporting the searing heat and a possible retreat and withdrawal of equipment. “I don’t care about the [fire] engines, they can be replaced. Just get those people out of there,” he relayed over the radio, according to the Parkersburg reporters. “We’re really feeling the heat,” one firefighter radioed back. “Leave them babies [referring to the trucks] and run,” said the chief. “If you feel it’s safer, then come up here,” the chief advised. Another photo from the “Parkersburg News,” taken from the other side of the Ohio River, showing two areas of the Shell plant in flames – at right, where the initial explosion occurred, and tank storage area, to the left, where projectiles from the first explosion caused several tanks there to ignite & leak. (Source: Mackey’s Antiques & Clock Repair, Parkersburg, WV). At one point, a giant, elongated plume of thick black smoke moved away from the plant and was visible stretching over nearby areas as the fire burned. Two of the burning chemicals in the blaze were petroleum-based solvents, cyclohexane and styrene monomers, according to Ohio Environmental Protection Agency spokesman Rob Berger. Both are used in the production of plastics and can produce irritating or poisonous gases.“…Former sheriff Bob Schlicher later told us that officials simply could not explain why the entire tank farm did not explode that day…” Authorities first ordered the evacuation of 15 homes in Porterfield, five miles west of Belpre, then ordered the evacuation of everyone within a one-mile radius of the plant, on both sides of the Ohio River. In all, 1,700 people were evacuated. US highway 50 was shut down and an advisory was issued to boaters on the Ohio River to avoid the area because of the smoke. …The most memorable moment came as I was reporting from the press pool location, in the parking lot of the Belpre Church of Christ late that morning. While on-air, I looked up and saw a parade of fire engines racing away from the scene and past the church. They had run out of fire-fighting foam. As urgently as possible, hundreds of residents were evacuated from Porterfield, Blennerhassett Heights, and the portion of Belpre west of Farson Street. Former sheriff Bob Schlicher later told us that officials simply could not explain why the entire tank farm did not explode that day. He said that, had the expected blast occurred, the results would have been unimaginably worse…. The other two victims were Gary Reed, 41, who enjoyed the outdoors and left behind his wife, Julie, and two kids, Alexis, 7, and Ashley, 10. George Nutter, 50, was an avid woodworker, leaving behind his wife, Brenda, and two children, Michael, 22, and Heather, 18. Shortly after noon on the day of the fire, Ohio Governor George Voinovich declared a state of emergency in Washington County, Ohio where the plant and Belpre were located. He had been advised that the fires at the Shell plant were burning out of control and posed a threat to the health and safety of residents and rescue crews. Voinovich also ordered the Ohio National Guard to fly 8,000 pounds of foram from Rickenbacker Air Base in Columbus, Ohio to Wood County Airport as local foam supplies were low. More foam would be flown in later from Texas. By late afternoon the day of the explosion, the fires at the Shell plant were brought under control. “The large fire is now out,” reported one Belpre firefighter. “All the firefighters are going through detoxification to assure they don’t have any chemicals on them.” Evacuated residents were also allowed to return to their homes later that afternoon. But at that point, it was known that at least one worker was dead and two others were missing. Six days later, industrial cranes were still working at the site clearing through heavy debris, as a search continued for the two other plant workers, then presumed to have died in the blast. Meanwhile, liquid chemicals from the burning and burst tanks had been seeping into the Ohio River, which flows south along West Virginia, then west along the northern Kentucky border to the Mississippi River. After the explosion, a long slick of ethylene dibromide formed in the Ohio River and began moving down-river with concentrations of more than 100 times the federal drinking water standard. As the spilled chemicals moved downstream toward the Mississippi, towns such as Ironton and Portsmouth, Ohio, and Huntington, West Virginia, began to shut their water intakes. By June 7th, Ironton, Ohio was dependent upon barges bringing in fresh drinking water. By then, the chemical slick on the Ohio River stretched downstream for miles. EPA ordered Shell to begin a clean up, monitor on-site run-off and movement of the chemical spill in the river, develop a warning system for downstream water users, provide alternative drinking water supplies for those users, and assess all off-site environmental damage. 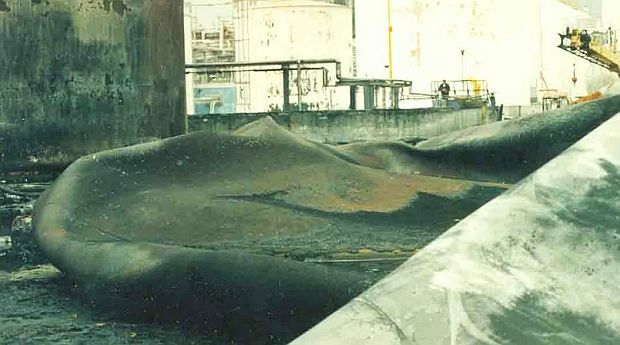 In the aftermath of the May 1994 explosion & fires, one portion of the Shell complex revealed a collapsed tank and other damage. Note distant worker standing on platform near right center of photo. Source: Mackey’s Antiques & Clock Repair/Mike Cottrell. Within a few weeks of the explosion, a number of residents in the area filed a class-action lawsuit seeking damages for the evacuation and exposure to harmful chemicals. EPA would later report that more than 1 million pounds of toxic chemicals were released during the fires. In the lawsuit, most of the residents were seeking compensation for property damage. The lawsuit also sought, at Shell’s expense, medical testing of people living near the plant and a determination of whether the gases endangered their health. That lawsuit was not certified as a class action, but six individual cases did go forward. Families of the three workers killed in the blast filed wrongful death suits against Shell seeking $20 million each in damages. Others in the community, however, were worried about jobs, and a rally was held in Porterfield on June 5th, 1994. Hundreds of people turned out voicing their support for the company and carrying signs that they stood behind the company despite the explosion. Meanwhile, investigations by Shell, the state of Ohio, and federal authorities were all underway. 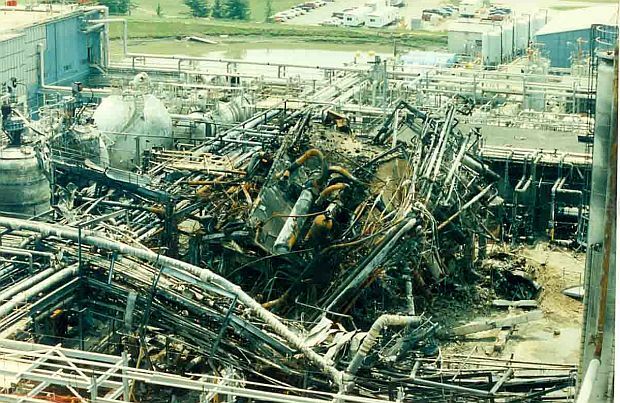 Another photo of the internal damage found at the Shell chemical plant in Belpre, Ohio in the wake of the May 1994 explosion and fires. Source: Mackey’s Antiques & Clock Repair/Mike Cottrell. By late June 1994, Shell said it was preparing to resume operations at the plant, although at a reduced level. In July, when Shell Oil (U.S.) made its quarterly report, it booked a loss and recorded $233 million in costs from the Belpre explosion. 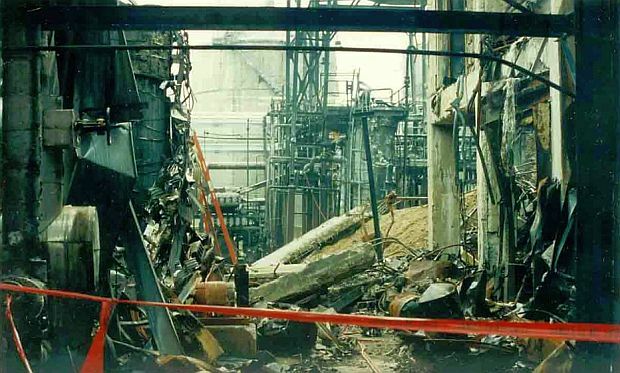 In October 1994, Shell reported that one of the three workers killed in the explosion helped cause the accident by failing to follow established operating procedures, but declined to name which worker was responsible. A month later, the company announced it was planning to rebuild the damaged portions of the plant and have it back on stream within one year. In late November 1994, Shell agreed to pay a fine of more than $3 million to the U.S. Occupational Safety & Health Administration (OSHA) for federal safety violations that occurred in connection with the Belpre explosion. At the time, it was the largest fine ever levied on an Ohio company, and the sixth largest ever for OSHA since the agency was created in 1970. OSHA had found 42 violations at the Belpre plant. A broader look at the Shell chemical plant and one of the damaged areas at center following the May 1994 explosion, with the Ohio River and near shore of West Virginia at the top of photo. Source: Mackey’s Antiques & Clock Repair/Mike Cottrell. Shell, for its part, stated the agreement with OSHA was not an admission of any violations. Arnie Ditmar, Shell’s Belpre plant manager, said the company disputed many of OSHA’s allegations and conclusions, but that Shell decided against contesting the case. “It would have continuously distracted from our desire and need to move forward and focus on rebuilding our plant and returning to normal, safe operation,” Ditmar said. – Deborah J. Zubaty, OSHAMeanwhile, Shell’s internal investigation of the accident found employee error and equipment failure contributed to an abnormal chemical reaction and resulting explosion in the reactor unit. OHSA disagreed. “We don’t agree with Shell’s conclusion that it was operator error,” said Deborah J. Zubaty, director of OSHA’s Columbus, Ohio office at the time the agreement was announced. “We feel there were a multitude of causes,” though the agency’s investigation did not pinpoint one specific cause. The violations OSHA did find, however, indicated deficiencies in the company’s equipment, plant layout, production safety procedures, and training of its employees. OSHA also faulted Shell’s emergency response plan, noting that those who first responded were not wearing breathing apparatus to protect them against chemicals, including asbestos. A “closer in” look at some of the damaged areas of the Shell chemical plant following the May 1994 explosion and fires there. Source: Mackey’s Antiques & Clock Repair/Mike Cottrell. One of the OSHA violations revealed that Shell had an earlier experience with an “uncontrolled reaction” at the same reactor and the same chemical involved in the May 27th explosion. That event occurred on January 23, 1994, only four months earlier. Shell, in fact, had written a three-page memo on the January incident, but there was no further investigation and no report by the company. OSHA wasn’t informed about the January 23rd incident until the agency investigated the May 27th accident. Shell maintained it didn’t need to report the January 23rd incident because it was a minor incident that didn’t fall within OSHA’s reporting requirements. Shell’s Mike White said at that time that the company would have “vigorously contested” the OSHA charge on that count. White explained that the January 23rd incident “was not uncontrolled,” and that the attending technician knew what was in the reactor before allowing the reaction to proceed. The reaction was hotter than normal, he acknowledged, because of a frozen vent line due to extremely cold temperatures at the time. Nearly two years later, in September 1996, just as OSHA was about to publicly release its final report on the May 1994 Belpre accident, Shell filed a lawsuit to block the report. The OSHA report contained a more detailed narrative on the accident and described what the agency believed were contributing factors.…Shell filed a lawsuit to block OSHA’s report on the Belpre explosion. Shell, then facing litigation from the families of the dead workers as well as other cases for property damage from local residents, was doing what it could to limit possible awards in court and keep the company’s name out of the newspapers and media. Shell’s lawyers met with OSHA staff on September 18th, and an agreement was reached to withhold the OSHA report until Shell had a chance to make its case before a federal judge. Shell then filed suit in U.S. District Court in Houston to formally block the report’s release. Shell argued the OSHA report contained trade secrets and law enforcement information that is exempt from the Federal Freedom of Information Act. Shell had also learned that the Charleston Gazette newspaper of West Virginia had sought a copy of the report under the Freedom of Information Act. Under that law, OSHA is required to inform companies of requests for such reports. OSHA had already explained to Shell that it was intending to delete portions of the report that contained trade secret information. Although OSHA had prepared to delete more of the report after rereading some of Shell’s earlier letters, OSHA still favored releasing the report. This article is one in an occasional series of stories at this website that feature the ongoing environmental and public safety impacts of various industrial disasters and accidents – oil and chemical spills; explosions and fires; toxic and hazardous waste issues; air and water pollution; and other such occurrences. These stories cover both recent incidents and those from history that have left a mark either nationally or locally; have generated controversy in some way; have brought about governmental inquiries or political activity; or generally have taken a toll on the environment, worker health and safety, and/or local communities. Shell, in its court documents, argued against disclosure of the report since its was “based almost exclusively on confidential and privileged documents and information that Shell had voluntarily given to OSHA, which Shell would not release to the public.” Shell also said the report was “an investigatory record prepared by OSHA for law enforcement purposes, and its disclosure would unfairly prejudice Shell in pending litigation. . .” Shell’s request to prevent the OSHA report’s public release went before the US District Court in Houston – where Shell’s U.S. headquarters are located — and was granted a “protective order” to keep the report under wraps while Shell was in litigation. 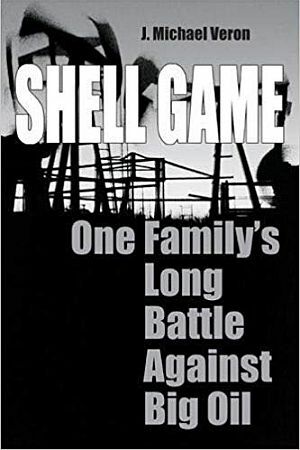 In January 1997, Shell settled the wrongful death lawsuits with the families of three dead workers. Each family received payments of between $2.1 and $2.4 million in out-of-court agreements. Other litigation with 44 residents seeking damages from the Belpre explosion and fire also proceeded, but it is unclear what the details and final outcome of those actions were, or if any settlements were made. And it appears that OSHA’s more detailed report and narrative on the Belpre, Ohio explosion was never publicly released. 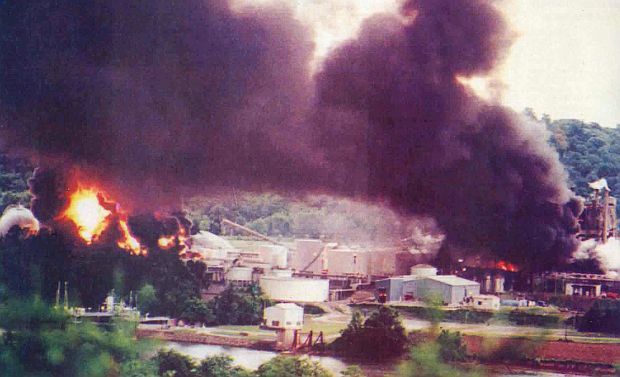 At the Shell Belpre plant, however, there was another incident – an August 1998 explosion. This time it was a hydrogen explosion in a compressor unit. The blast rattled buildings up to five miles away. A fire ensued but was brought under control by the plant’s firefighters within 30 minutes. Shell, meanwhile, had begun an internal process of reevaluating its chemical strategy, and decided to exit some of its chemical lines. In December 1998, Shell announced that it planned to sell the Belpre chemical complex, but would continue to operate the plant until a new owner was found. After 18 months on the sales block, Shell finally sold the Belpre plant to Rippelwood Holdings LLC in September 2000 for an estimated $600 million. Rippelwood then operated the plant until late December 2003 when the plant was again sold, this time to the Texas Pacific Group, a private investment partnership, for $770 million. As of 2018, the Belpre plant continues to operate under these owners, and is known as Kraton Polymers. 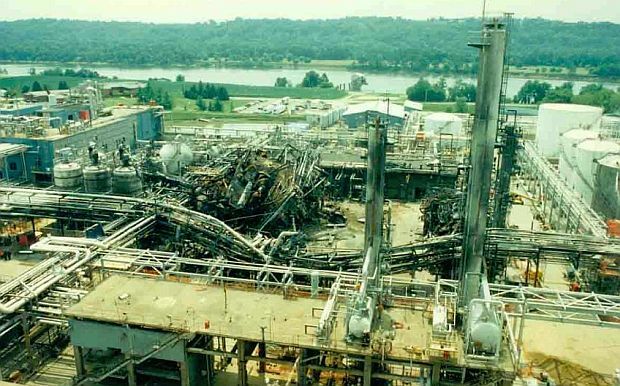 Following the 1994 explosion, new technology and safety measures were added to the chemical complex, and subsequent owners report they have continued to spend money on system upgrades, worker safety, and environmental protection. One of the logos used by Royal Dutch Shell. While Shell sold its chemical plant at the Belpre, Ohio location, it has been a major player in the global chemical business for decades. Royal Dutch Shell, known commonly as “Shell Oil,” is among the world’s top five corporations, one of the four “supermajors” in the oil and gas industry. It is also among the world’s top 15 chemical companies, with more than $20 billion in annual chemical sales. Formed in the 1907 merger of Royal Dutch Petroleum and Shell Transport & Trading, Shell Oil today has operations in more than 140 countries. In 2017, the company’s total annual revenues were in excess of $300 billion, making it the world’s fifth largest corporation by sales. It’s profits in 2017 were $13.4 billion. In recent years, Shell has also begun a small renewable energy business developing wind, hydrogen, and solar power. Still, as of 2018 Shell appears to be a fully-committed fossil fuels player, with continuing investments in exploration, refining, transport, and petrochemicals. The company’s 2016 acquisition of the BG Group (formerly British Gas) for $53 billion made Shell the world’s largest player in liquefied natural gas and also bolstered its position in the Brazilian oil business while expanding its holding of offshore deep water assets. Today, in the oil and gas business, only ExxonMobil is bigger. 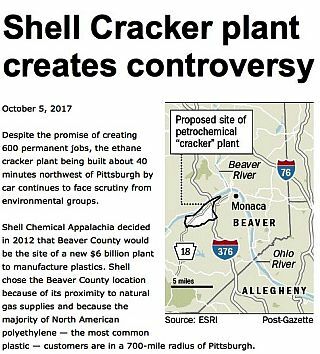 From an October 2017 story on Shell’s cracker plant, The Pitt News (University of Pittsburgh). Map, Pittsburgh Post-Gazette. In North America, as of 2018, Shell has begun building a $6 billion ethylene cracker plant for the production of plastics north of Pittsburgh, PA along the Ohio River. This location was chosen in part for its proximity to a huge feedstock source: the Marcellus Shale natural gas fields, where hydraulic fracturing, or “fracking,” is the current method of extraction. Shell has also stated that 70 percent of its polyethylene customers in North America are within a 700-mile radius of the Pittsburgh location. In addition to the cracker plant itself will be the 97-mile Falcon Pipeline project that will collect and transport more than 100,000 barrels of ethane daily to feed the cracker. As work on the Shell plant has gone forward, environmentalists in the area, along with some citizens and clergy, have expressed concerns over the plant’s potential pollution impacts. Others worry about public safety issues. Meanwhile, Pennsylvania officials, supporting the Shell cracker, have awarded the company a $1.7 billion, 25-year tax credit. 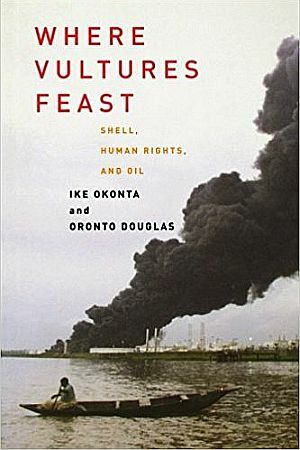 Paperback edition of “Where Vultures Feast,” a 2003 book about Shell’s performance history in Nigeria. 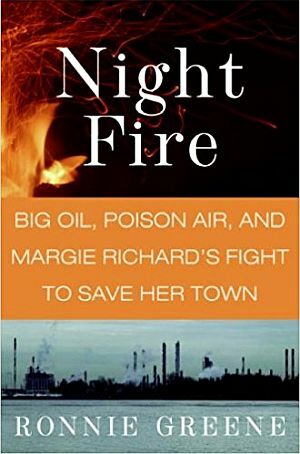 Ronnie Green’s 2008 book featuring Louisiana resident Margie Richard’s 15 year fight with Shell Oil’s Norco, LA refinery & chemical plant that polluted her community and sickened its residents, by Amistad publishers, 288pp. August 2011. A Royal Dutch Shell pipeline off the coast of Scotland at the company’s offshore Gannet Alpha oil platform leaked more than 1,300 barrels of oil into the North Sea. September 28, 2011. A 32-hour fire at Shell’s Pulau Bukom oil refining and petrochemical complex in Singapore, brought an $80,000 fine from Singapore’s Ministry of Manpower on October 30, 2012 for “lapses in workplace safety” that led to the blaze. December 21, 2011. Up to 40,000 barrels of crude oil was spilled while being transferred from a floating oil platform to an oil tanker 75 miles off the coast of the Niger delta in the Bonga offshore oil field, off Nigeria, Africa. May 12, 2016. More than 88,000 gallons of crude oil discharged from a Shell subsea wellhead into the Gulf of Mexico off Timbalier Island from a flow line about 90 miles off the coast of Louisiana in the Glider Field near the company’s Brutus Tension-Leg Platform. May 30, 2016. Shell Oil’s San Pablo Bay Pipeline, which transports crude oil from California’s Central Valley to the San Francisco Bay Area, leaked an estimated 21,000 gallons into the soil. August 11, 2016. An explosion and major fire rocked the Shell/Motiva oil refinery in Convent, Louisiana, leading to the evacuation of 1,400 workers and damage to one of the refinery’s processing units. No injuries were reported. July 31, 2017. A massive fire erupted at Shell’s Pernis refinery in Rotterdam in the Netherlands — the largest refinery in Europe – causing a blackout and forcing the company to halt all loadings. November 8, 2017. Shell’s Enchilada oil platform in the Gulf of Mexico was shut down and all associated production stopped after a fire broke out on the rig. Two people were injured and the crew of 46 were evacuated to a nearby platform. There was also a report of a light sheen of oil on the water north of the Shell platform, which is located about 112 nautical miles south of Vermilion Bay, Louisiana. March 4, 2018. Fire and rescue crews were called to the Shell Refinery in Saraland, Alabama for an oil pump fire. No injuries were reported. 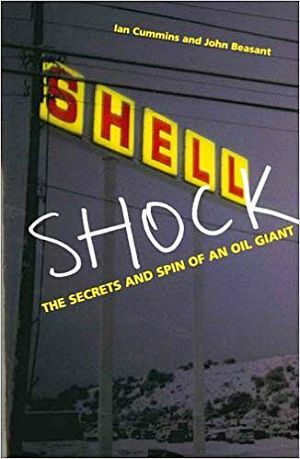 Ian Cummins and John Beasant’s 2005 book, “Shell Shock: The Secrets and Spin of an Oil Giant,” Mainstream, 256pp. 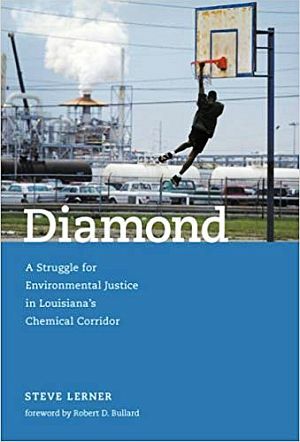 Steve Lerner’s 2004 book on the Diamond community of Norco, LA, an African-American subdivision sandwiched between a Shell oil refinery and a Shell chemical plant. MIT Press, 344pp. Lawyer and oil royalty landowner J. Michael Veron’s 2007 account of a nine-year legal battle with Shell Oil over decades of pollution on his family's Louisiana farm. Lyons Press. 272pp. 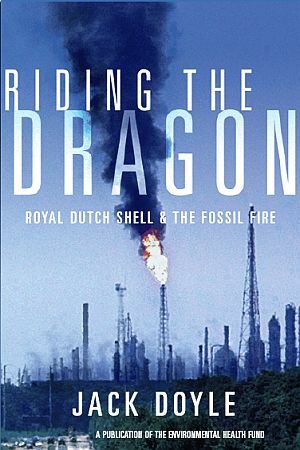 2002 book published by the Environmental Health Fund of Boston, “Riding the Dragon: Royal Dutch Shell & The Fossil Fire,” includes case histories of Shell environmental and public safety performance over several decades; 350pp. 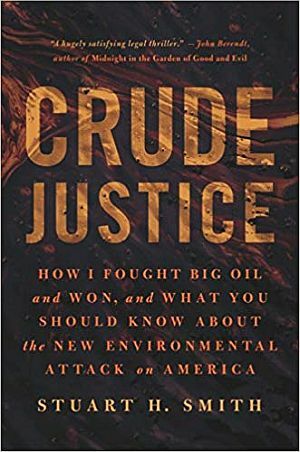 Stuart Smith’s 2005 book about battling oil companies (including Shell) in Mississippi over oil- derived radium contamination and other oil/environment warnings. BenBella Books, 264pp. “Ohio Chemical Plant Erupts In Fire,” Chicago Tribune, May 27, 1994. Deborah Paolucci and Jesse Mancini, “Disaster at Shell,” The Parkersburg News (Parkersburg, West Virginia), May 28, 1994, p.1. Associated Press, “Explosion, Fire Force Evacuations; Governor Declares State of Emergency in Belpre,” The Saturday Review (East Liverpool, Ohio), May 28, 1994, p. 1. “Explosion at Plant Kills 1; 2 Missing,” Columbus Dispatch, (Columbus, Ohio), May 28, 1994. U.S. Department of Labor, Occupational Safety and Health Administration, Accident Report Detail, Accident: 170662498 – Three Employees Killed In Chemical Plant Explosion, Report ID: 0522500 — Event Date: May 27,1994. Associated Press, “Ohio Chemical Plant Fire Forces 1,700 to Evacuate,” The Washington Post, May 28, 1994, p. A-3. “Shell Chemical Fire, Belpre Ohio,” Mackey’s Antiques & Clock Repair, Parkersburg, West Virginia. K.C. Ottenbacher, (UPI, Belpre, OH), “Third Fire Victim Identified,” May 29, 1994. “Search Continues for 2 Bodies at Blast Site,” Columbus Dispatch, May 31, 1994. Susan Ainsworth, “Fatal Fire at Shell Plant Hits Elastomers Market,” Chemical & Engineering News, June 6, 1994, p. 5. “Ironton Hauls In Drinking Water,” Columbus Dispatch, June 7, 1994. U.S. Environmental Protection Agency, Region 5, Order of Injunctive Relief and Corrective Action, June 10, 1994, Case Name: Shell Oil Company; Location: Belpre, OH; Statute: CERCLA section 106 UAO. 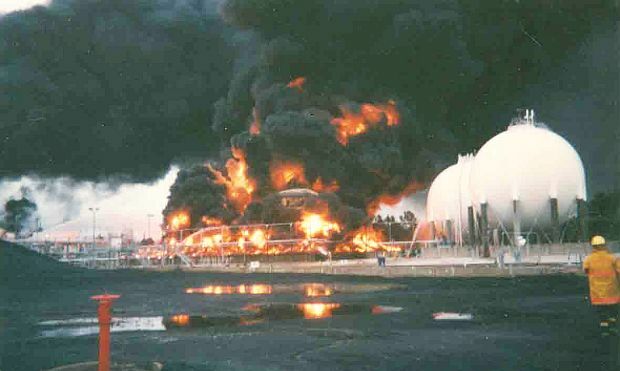 “EPA Orders Shell to Clean Up After Fire At Ohio Facility,” Dow Jones News Service, June 13, 1994. “Shell To Check River for More of Chemical,” Columbus Dispatch, June 15, 1994. “Shell Ordered to Test, Clean Up Belpre,” Chemical Week, June 22, 1994, p.4. John Seewer, Associated Press, “Reactions to Disaster Mixed in Company-Dependent Town,” The Register Herald (Beckley, WV), October 2, 1994, p. 5-C.
Associated Press, “Shell Chemical Implements Safety Proposals after Blast,” Journal of Commerce, October 26, 1994. “Belpre Blast Alarm Ignored Says Shell,” ICIS Chemical Business, November 14, 1994. Jim Woods, “Shell Agrees To Pay $3 Million OSHA Fine For Fatal Blast,” Columbus Dispatch, November 23, 1994, p. 1-A. Reuters, “Shell Unit to Pay $3 Million to Settle Explosion Charges,” Journal of Commerce, November 27, 1994. Rocky Lantz, “Reconstruction: Shell’s $80 Million Recovery Helps Area Economy,” Parkersburg News, May 28, 1995, p. 1. Ken Ward, Jr., “Shell Sues To Stop Release of Belpre Report,” Charleston Gazette, Septem-ber 25, 1996, p. 5-A. Cynthia Sequin, “Shell Requests OSHA Report Remain Sealed,” Parkersburg News, June 28, 1997, p. A-1. Shell Oil Co. v. United States Department of Labor, No. H-96-3113 (S.D. Tex. Mar. 31, 1998). Associated Press, “Hydrogen Explodes at Chemical Plant; No Injuries,” August 10, 1998. Associated Press, “Chemical Company to Sell Plastics Division,” Plastics News, September 6, 2000. Associated Press,“Kraton Sale Estimated at $600 Million,” Plastics News, September 18, 2000. Mike Cullums, “’It Could Have Been Much Worse’– Remembering the 1994 Shell Plant Explosion,” WMOA1490.com (radio station, Marietta, Ohio), May 27, 2014. Henny Sender, “Texas Pacific Buys Ripplewood Unit,” Wall Street Journal, November 11, 2003. Bruce Davis, “Investment Firm to Buy Kraton Polymers From Ripplewood,” Rubber & Plastics News, November 24, 2003. Alex DeMarban, “Shell’s International Record Slammed by Opponents of Arctic Oil Drilling,” Anchorage Daily News, June 12, 2012. “Shell Oil: A Record of Environmental and Corporate Malfeasance,” Alaska Wilderness League, 2012, 51pp. Remy Samuels, “Cracker Plant Creates Controversy,” The Pitt News(University of Pittsburgh), October 5, 2017. Shell’s Ethane Pipeline ‘Right on Track,’ Construction Starts 2019,” MarcellusDrilling .com, June 22, 2017. “Shell Pipeline: Not Quite the ‘Good Neighbor’,” FracTracker.org, April 2, 2018. Steven Mufson and Chris Mooney, “Shell Foresaw Climate Dangers in 1988 and Understood Big Oil’s Big Role,” Washington Post, April 5, 2018. Fiona Harvey, “Shell Stops North Sea Leak after 10 Days; Scottish Government Launches Investigation into Safety Procedures after Worst Oil Spill in UK Waters for a Decade,” The Guardian, August 19, 2011. “Fire at Shell’s Bukom Refinery,” The Straits Times ( Singapore), September 29, 2011, p. 1. Ministry of Manpower, Singapore, “Shell Fined $80,000 for 2011 Pulau Bukom Refinery Fire,” Press Release, October 29, 2012. “Pulau Bukom Fire (2011),” InfoPedia / National Library Board, Singapore, July 2016. Lim Yi Han, “Fire at Shell’s Pulau Bukom Plant Leaves 6 Injured, Including 3 in Critical Condition,” The Straits Times (Singapore), August 21, 2015. Sarah Kent, “Shell Oil Spills Led to ‘Astonishingly High’ Pollution in Nigeria; Stalled Cleanup of Leaks from Faulty Pipeline in 2008 Is Endangering Locals, Letter Warns,” Wall Street Journal, March 23, 2017. Oliver Milman (New York), “Shell Working to Repair Leak That Spilled 2,000 Barrels of Oil into Gulf of Mexico; Thursday Leak Created a 13 Mile-Wide Slick on the Surface of the Water, from Group of Underwater Oil Wells 97 Miles South of Port Fourchon, Louisiana,” The Guardian, May 16, 2016. Emma Grey Ellis, “Bet You Didn’t Hear Shell Spilled a Bunch of Oil in the Gulf,” Wired, June 9, 2016 (on the inexact nature of reporting and recording spills; and why small spills matter). Reuters, “Shell Reports Small Explosion at Carson, California Facility,” June 11, 2018. Mark Schleifstein, “Shell Offshore to Pay $3.9 Million for 2016 Deepwater Oil Spill from Cracked Pipeline,” NOLA.com, July 7, 2018.